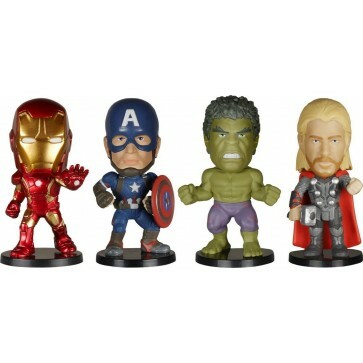 Thor, Hulk, Iron Man, and Captain America are coming to your living room as mini bobble heads! Each Avenger stands approximately 3-inches tall and all 4 characters are packaged in a displayable window box. The Avengers Age of Ultron Mini Wacky Wobbler 4-Pack is a great gift idea for any Marvel or Avengers 2: Age of Ultron fan! Ages 3 and up.